We have been back just 2 days and I have already had a few people stop me in the shop and say they didn’t see enough of Hawthorne on this last visit, which makes me smile as I love that folks are enjoying watching the process of making of a house into a home. You all know I like to keep the flow of the daily posts with lots of variety, so I am saving a few more for the next few weeks–I promise, more is coming. Today I will share a bit of how the back porch is coming along. We are so very excited with how it is shaping up. The biggest addition since we were last there are the 2 oversized sofas. We could not wait to get there and see how they looked in the space on this last trip, as they arrived about 6 weeks ago, and we were chomping at the bit to see them. They are identical, 7 feet long, extra deep, in a gray green heavy cotton duck. 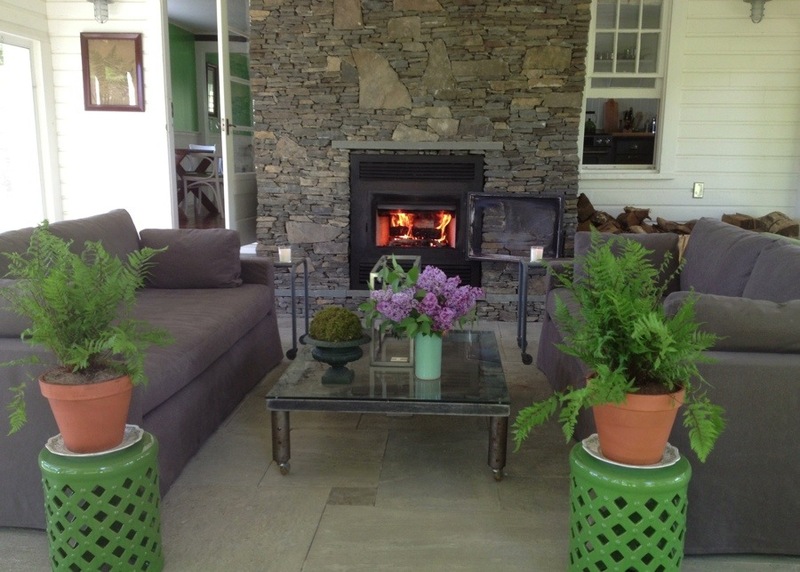 The color ended up working really well in the space, picking up on all the field stone color in the floor and above the fireplace. We spent a ton of time researching sofas, and these Restoration Hardware models just fit the bill in what we were going for. We wanted a really simple shape and arm, and the extra depth sealed the deal as they are incredibly comfortable to take a nap on. We spent a ton of time on this last visit on them reading, cocktail-ing, visiting with guests & chatting, and yes napping. The back porch was added on by the gentleman we bought the house from. His attention to detail is seen throughout. It really is such a beautiful room. The back porch is completely screened in. We bought glass inserts to replace the screens in the cold months, so we can really use the space throughout the year. 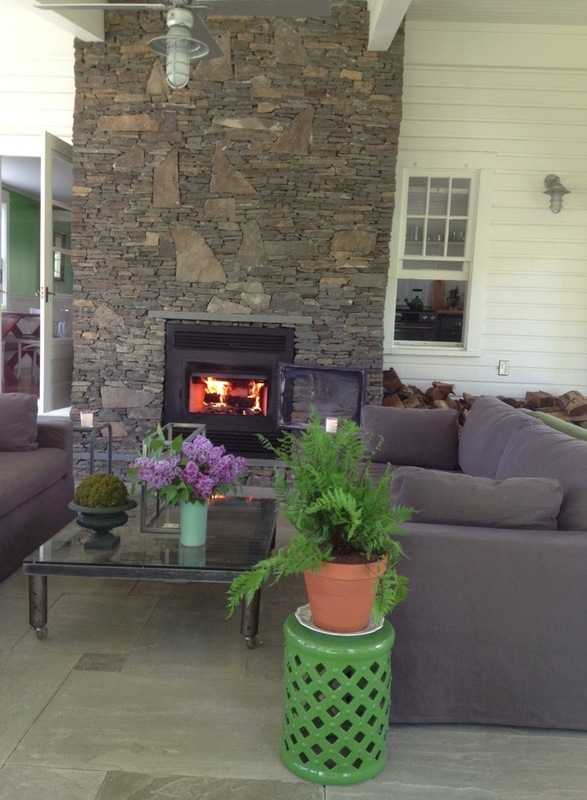 The fireplace is one of these models that is along the lines of a wood stove and pumps out incredibly amounts of heat. With the glass inserts in place of the screens and having a fire burning, we sat comfortably in the room in January when it was hovering around 10 to 20 degrees outside. 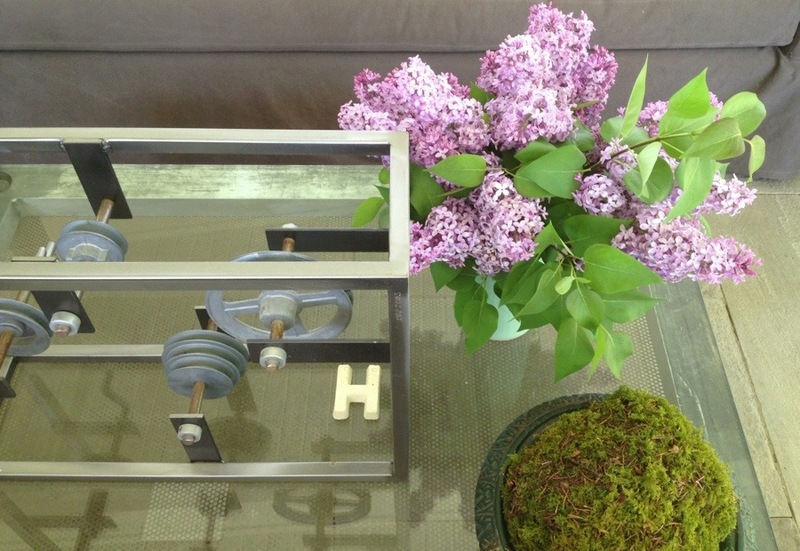 The coffee table we had sent from Seattle. We used it in our living room at The Gainsborough for years, but just knew the coloring of the metal would work perfectly against the field stone floor. Next up, 2 dining tables we have had our eye on that can be set next to one another to create a very long table for a big family dinner or dinner party. We are hoping these will arrive in time for our August visit. They also have folding legs, so they will be easy to fold up and take up to the top of the field that looks down into the valley for an alfresco Summer or Autumn dinner under the stars. 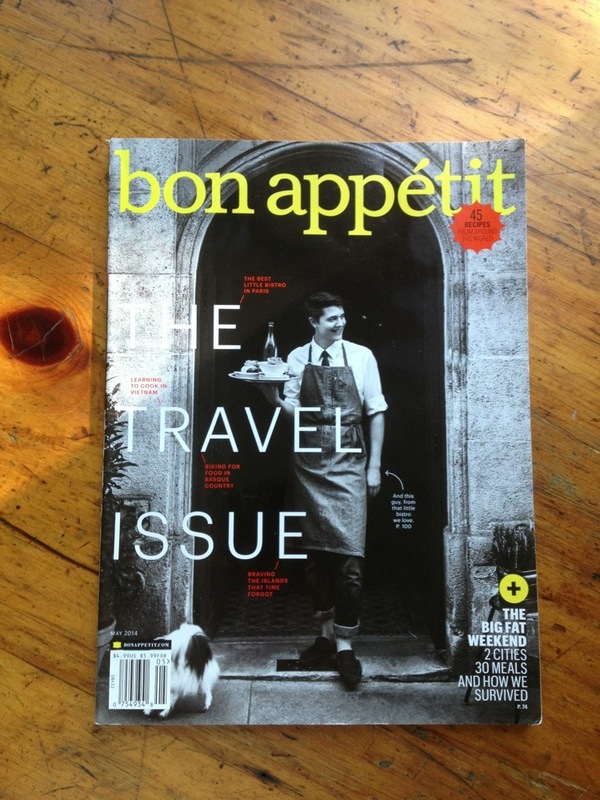 We got a stack of this book in a few days before we left for New York, and within fewer days the stack was gone. I was so bummed not to have snagged one before we left on our trip. So I was quite excited to see the stack replenished when I walked into the shop yesterday. 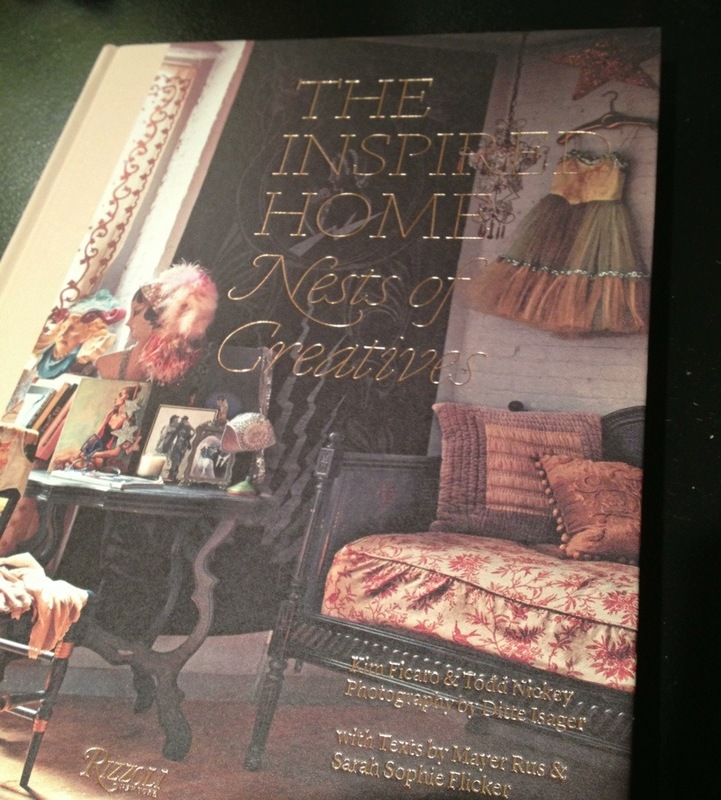 THE INSPIRED HOME Nests of Creatives is simply a very, very pretty book. Ethereal almost. There are so many ways photographers shoot rooms. 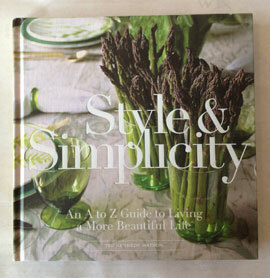 This book is shot by Ditte Isager in a lovely dreamy way. Not whole rooms but parts of them. A corner here, the side of a room there. You kind of feel like you could climb into the photo. They evoke a mood. A relaxed I want to sit in that chair in that photo with a glass of red wine and just look through this book vibe to it. They are not overly styled. Filled with page after page of the homes of creative folk. I always love the reference of a home as a nest, as I feel the ones I most gravitate to have that feeling. Things collected over time. Things that have deep meaning to the inhabitant. 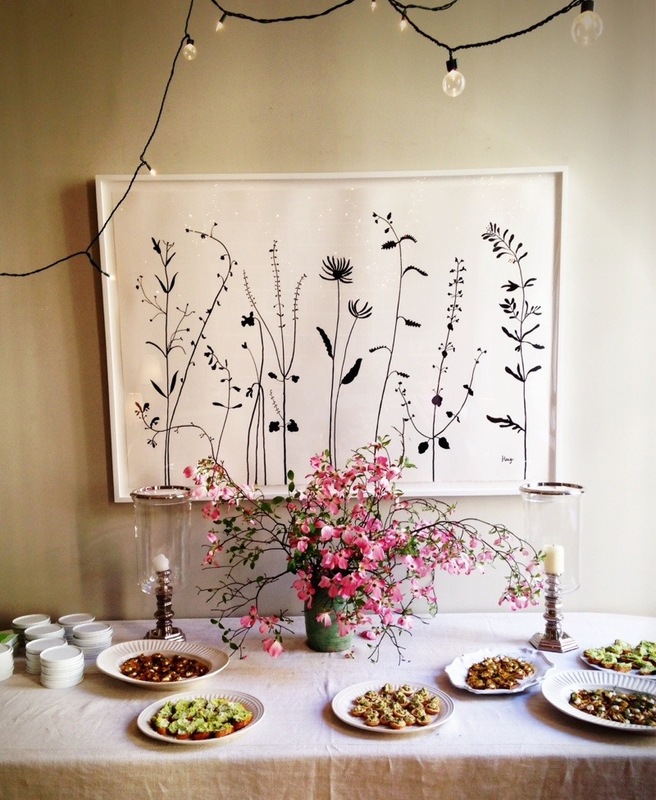 A tablecloth instantly adds visual interest to any table it graces. This is almost an identical table set-up as the one I posted yesterday, with the addition of a tablecloth. We were out vintage shopping on Saturday. The scouting for vintage wares in these parts is pretty off the charts. That has always been a large appeal for us to the area. Hop in the car and within 20 minutes in any direction and you can be knee deep into antiquing. We are so close to both Massachusetts and Connecticut, which makes a day drive feel like you have really been out for an adventure. 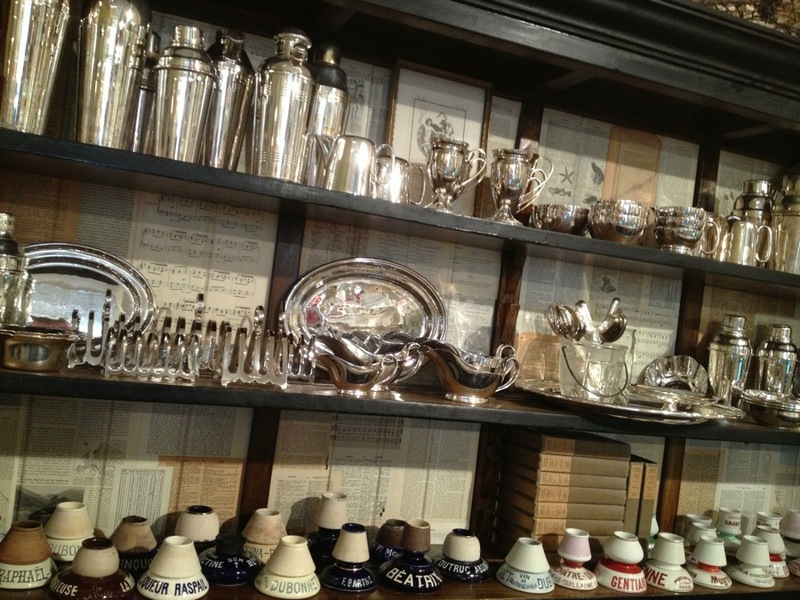 There are a row of antique shops/malls in Sheffield, Mass that we quite like. 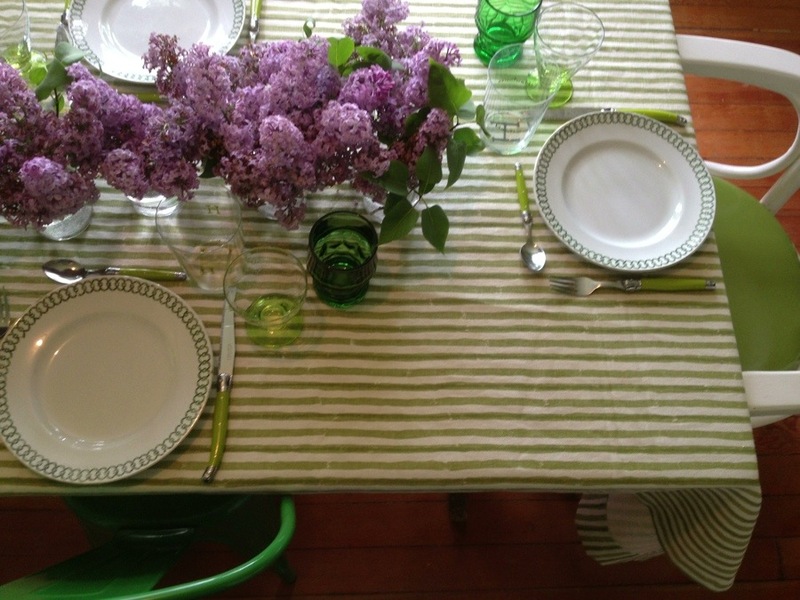 On Saturday we scored this cool green striped tablecloth for 20 bucks. It fit our dining table perfectly, and will also be great for our eventual picnic table set up outside in the field. 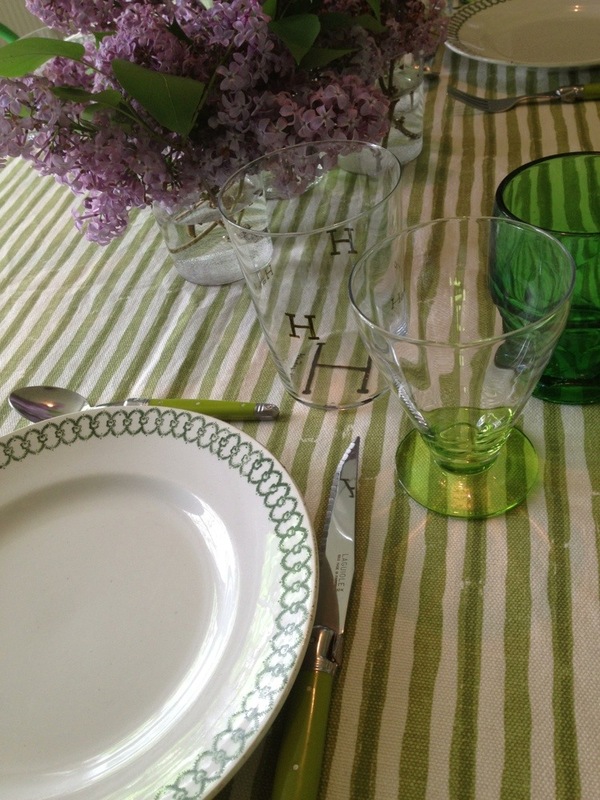 This table was set for dinner with guests. 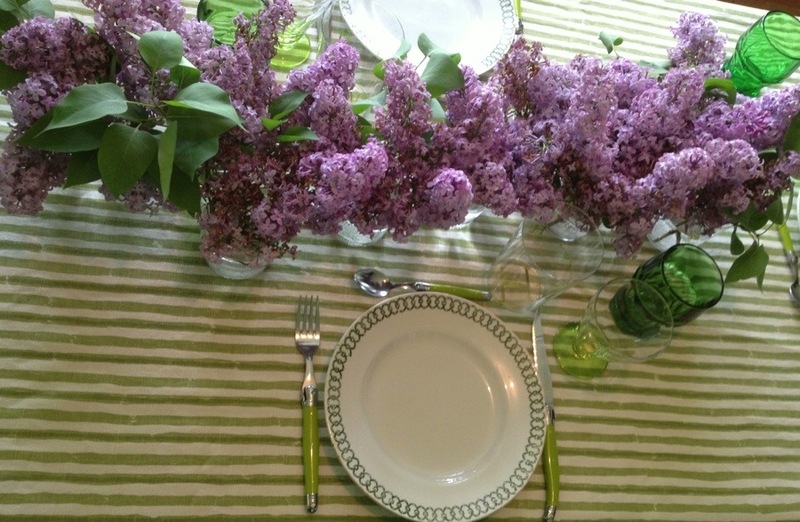 I spread out the lilacs just a tad so it filled in around the 4 place settings. 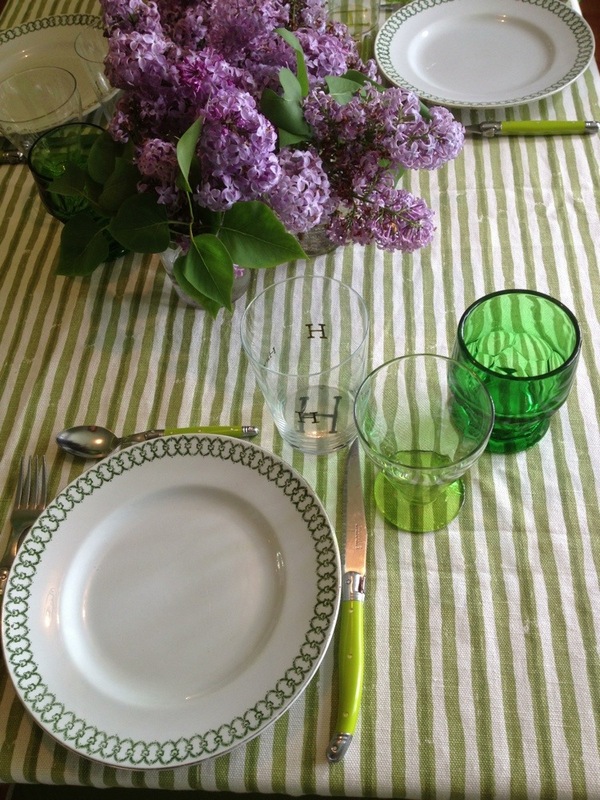 We also found sweet little green based glasses on Saturday, so I added those to the setting. 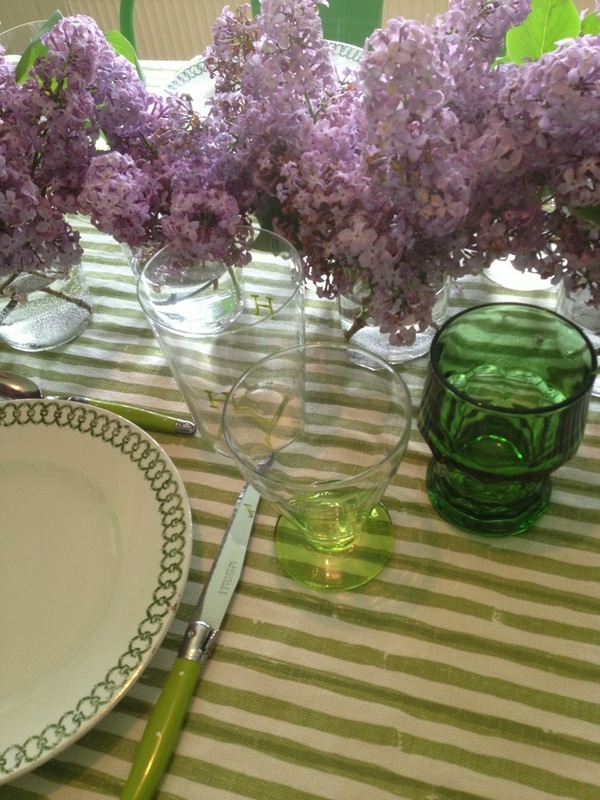 In a matter on minutes, the table just transformed by adding the tablecloth, adding a kick of color & texture. I liked both versions equally. Just fun to see how quickly you can change it all up when you add a tablecloth or piece of fabric. 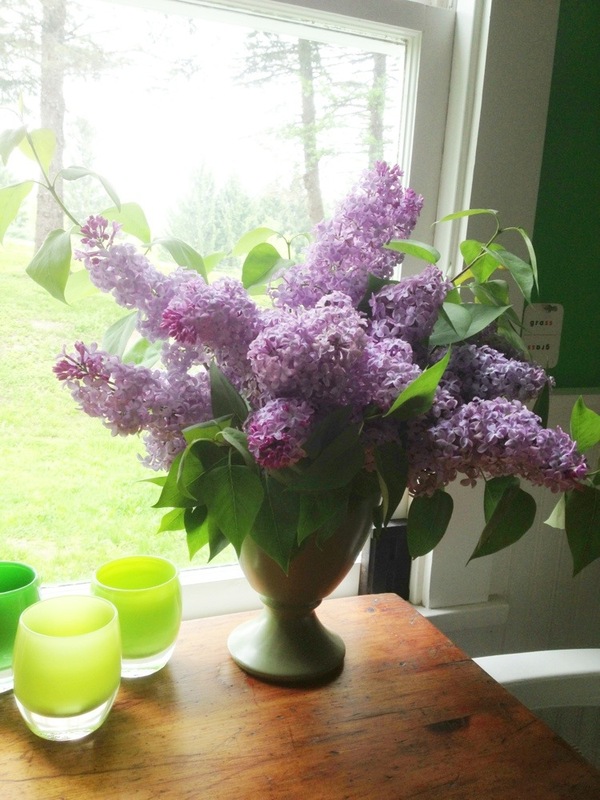 This visit lilacs have played a big part of the enjoyment. 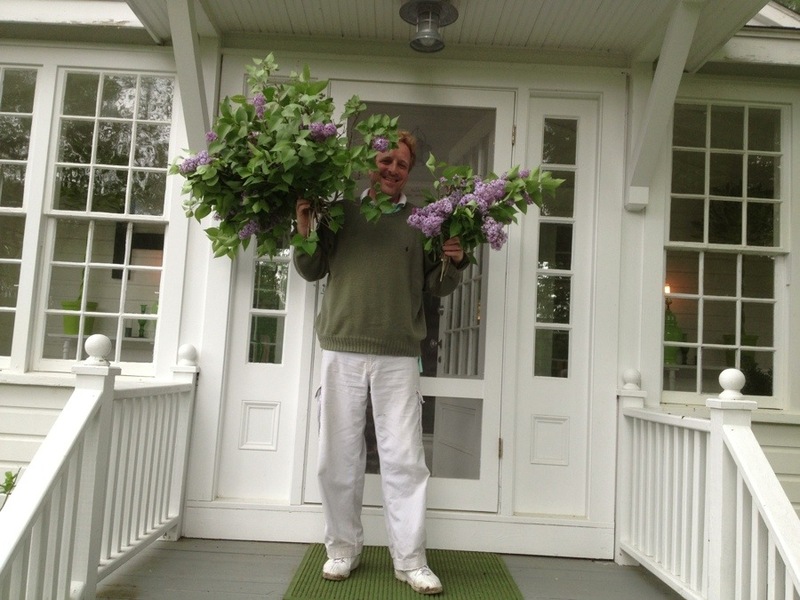 As I wrote about the other day, the 2 huge bushes have just been overflowing with blooms. TPS thinning them out a bit and we get to enjoy the fruits of his labor with flowers in the house. Above, Ted loaded up with them after a round of cutting. Hard to find words to describe how happy this all makes me. 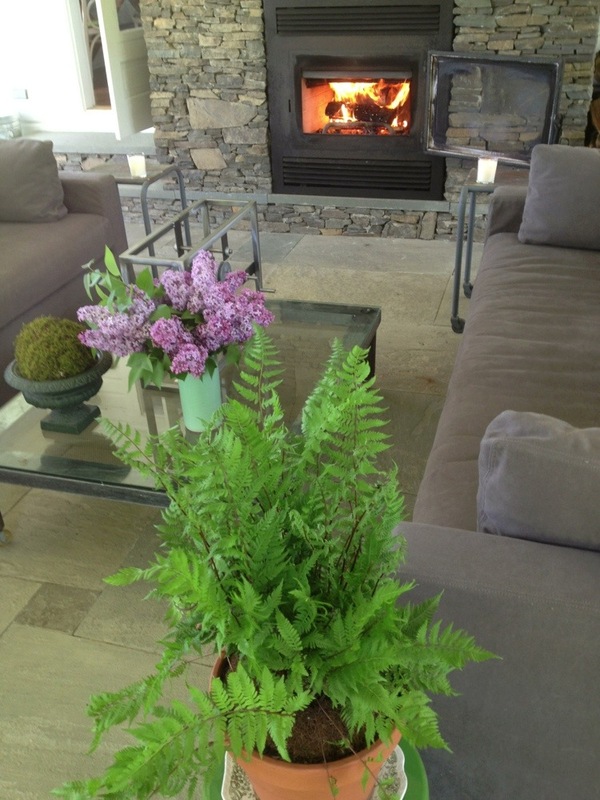 I start by cleaning and picking thru all the flowers, cutting away any dying blooms or dried out stalks. Then I cut the stem to the length I want, and split the bottom of the stem so it gets a chance to drink in lots of water. This would be a table set just for the 2 of us. I used the clear Marta glasses I am so fond of, which I wrote about in my book. They are stellar drinking glasses but also work swell for a vase. My idea was to mass a bunch of them together in the middle of the table so it looked like one large arrangement. 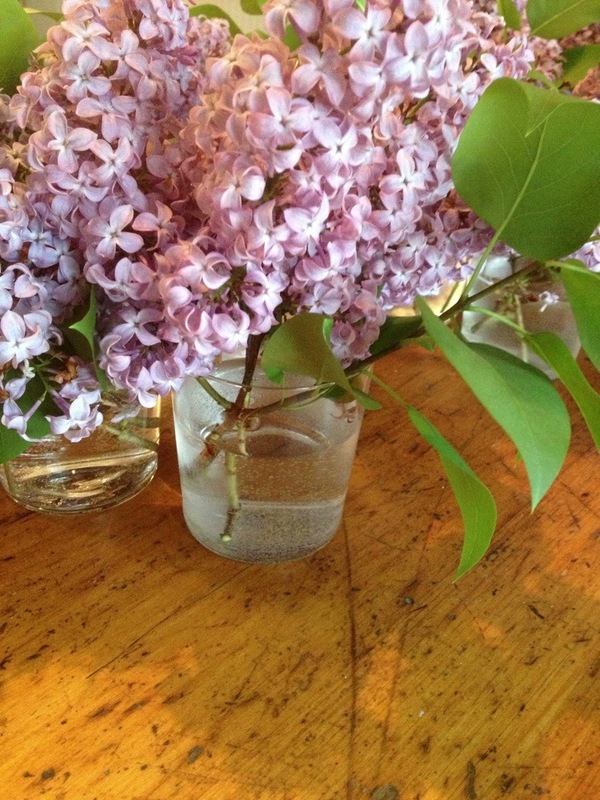 But it was actually a bunch of individual glasses close together holding all the lilacs. I left the tabletop bare and exposed. I love doing that. This is an old English table that has lots of interest and history showing in the wear of it. I love seeing the knots and the marks from years of use. 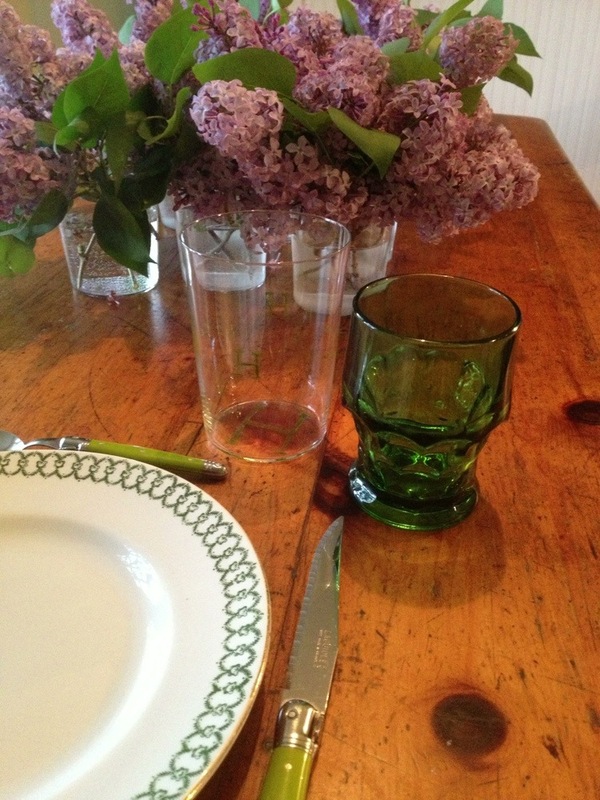 Then a simple place setting of mismatched glasses, silverware and a plate for a casual meal set amongst the lilacs. 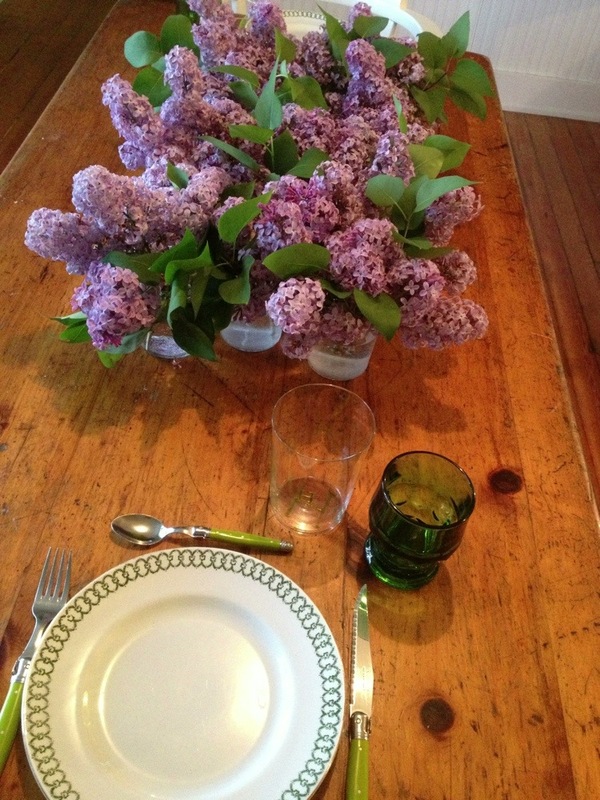 Tomorrow, I will show the same flowers but with a tablecloth and set for dinner with guests. It looks completely changed. Interesting what a tablecloth can do to create a different look altogether. Yesterday marked the third anniversary of my daily blog. My of my, how the time has sped by. What a delight it has been and continues to be to create a post each morning when I awake. I know I write often about a ‘journey’ but we are all on one. I just don’t want to overuse that sentiment, but I think it is so true. I guess that is why I use it often. I thank you for being on this journey with me. I am often told, whether in person or via e-mail how much joy the daily post brings to certain folks. Hearing that in whatever form brings me great joy. It is a circle I enjoy repeating. Write about beauty, happiness & joy–and in turn I feel such joy. For that, I will thank you, always. I share something with you, you in turn incorporate a bit of that in your life (whether it be a table setting, or a certain flower, or a recipe) and you end up sharing that with those you love. It is one creative, positive, love filled circle. The world is filled with good and bad. So often the emphasis is placed on the bad. Just turn on the news. Life goes by so quickly, I want to relish in the good. I love sharing all the good stuff I see each day with you. A lesson I learned early on by a coach of mine in tennis has stuck with me always. It is also a way that my father looked at the world, so I witnessed it each day from him–that so much of life is relative. There will always be someone that has more than you, and there will always be someone that has less than you. The trick in living well is being happy with exactly what you have. 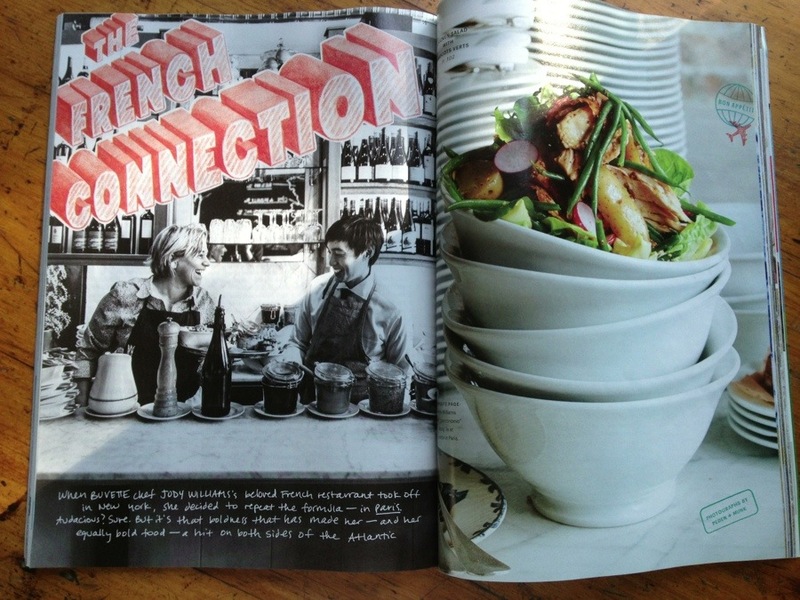 I’m catching up on reading this Holiday week-end, and just delighted to read about and see all the great visual & coverage the new Buvette in Paris received. 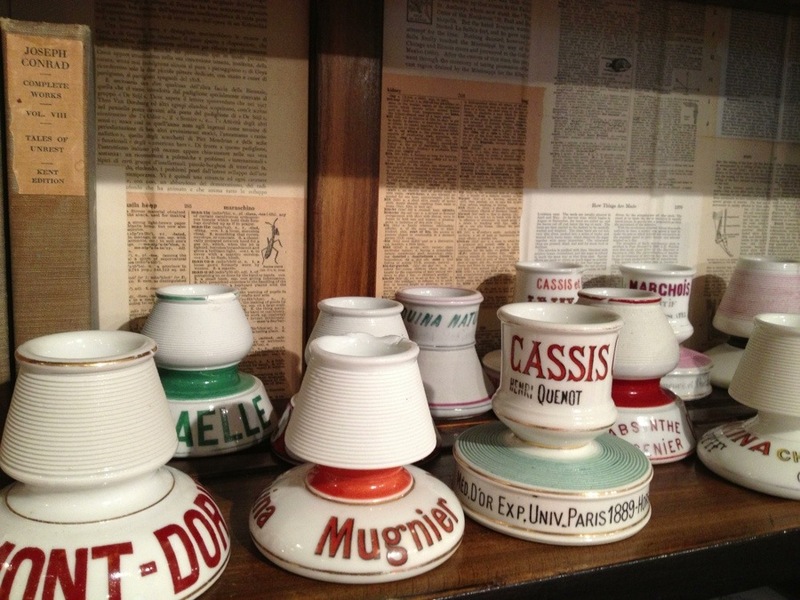 I have written much of my love of Buvette in New York, so it is so interesting & exciting to see images of how she recreated the magic of the eatery in Paris too. Sure enough, she did! Chef/owner Jody Williams not only creates brilliantly simple/refined/rustic food, she also creates brilliantly layered and oh so stylish spaces. 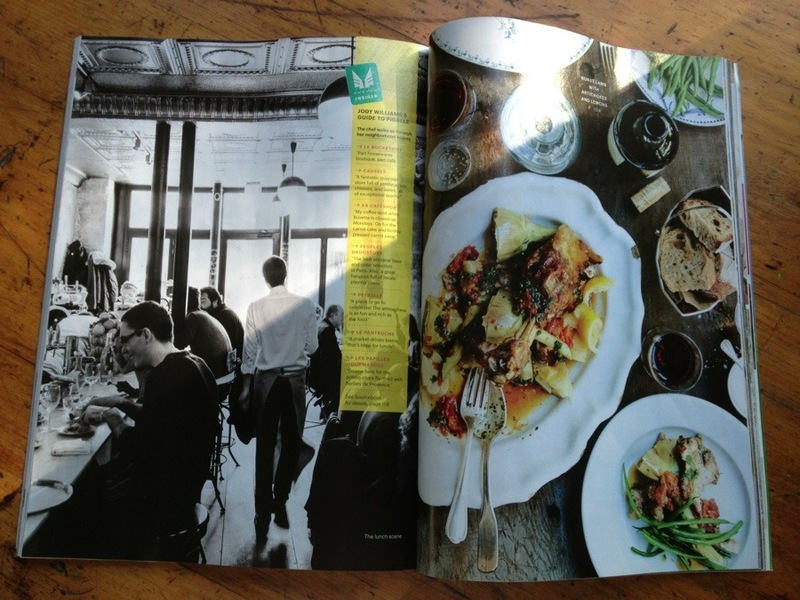 She takes a classic and puts her own twist on it–both in her food and her interiors. You just feel good in the space eating good food. Really as simple as that. 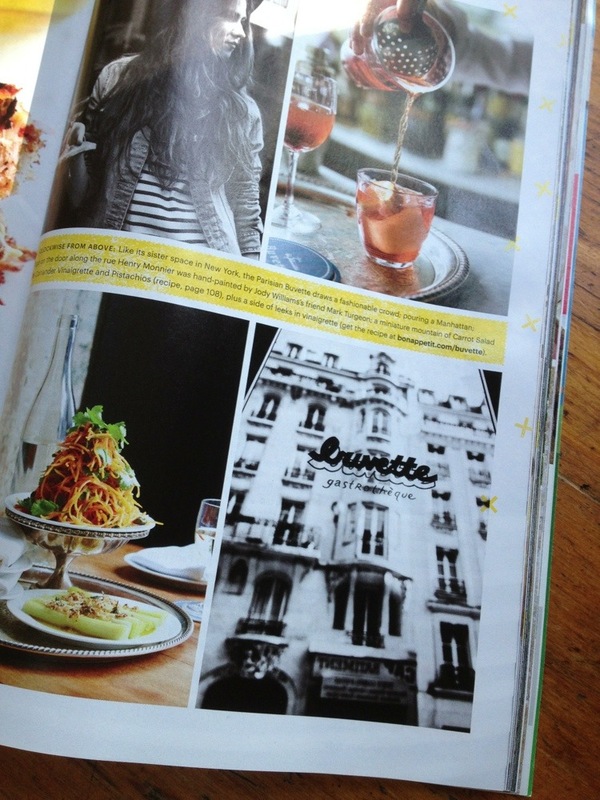 Now I can’t wait for a Paris trip to try her new establishment! 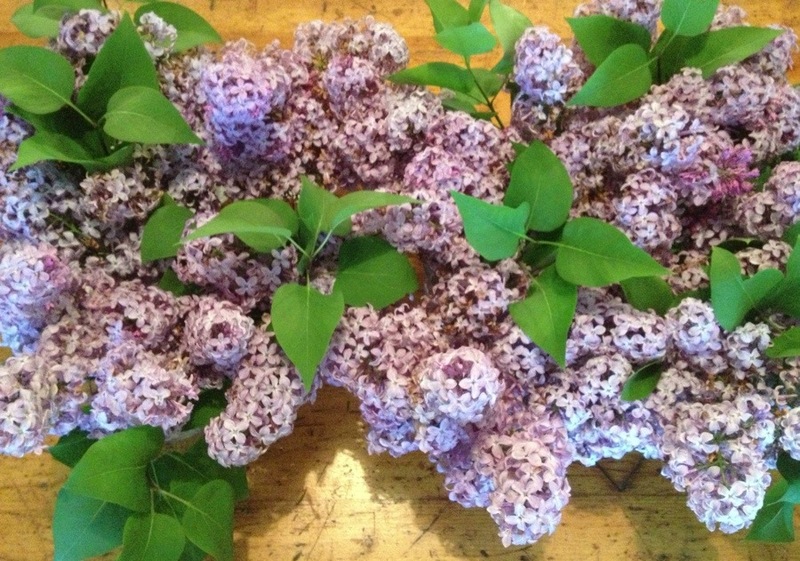 We have 2 lilac bushes on the property at Hawthorne and I must admit, I am a bit smitten. Still getting used to the idea that we can walk outside and clip a bunch of stems. I joked that I feel like I need to leave a 20 dollar bill by the bush after we leave. TPS has been going out each morning and clipping a few for me to play with. 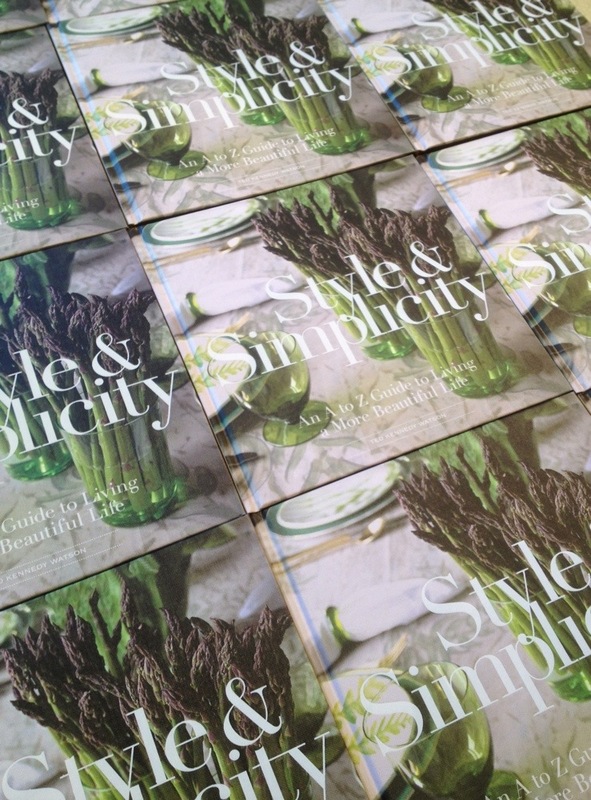 The vintage green McCoy happy as a clam to house such beauty. 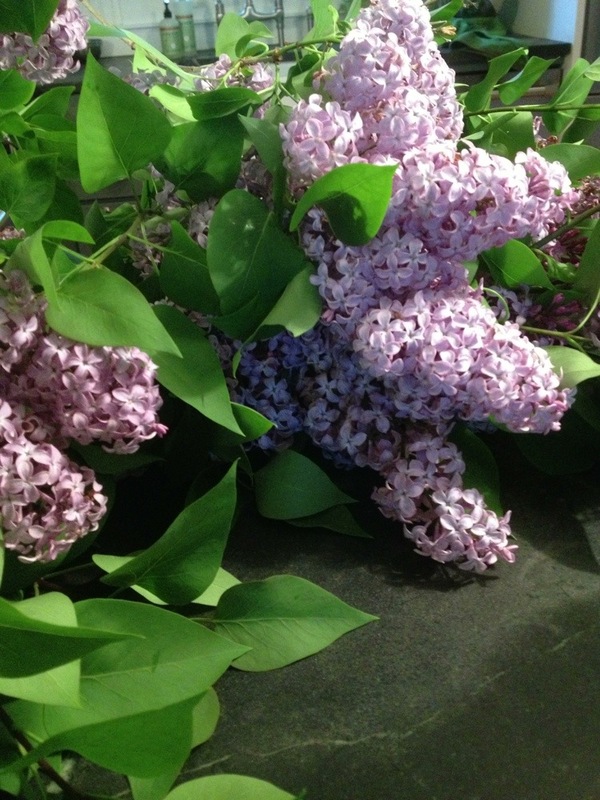 The heady scent filling the whole house. As promised, I want to share with you some images and thoughts from the party the other evening. I must admit, I am still a bit in a daze about how special and amazing it all was. Without sounding odd or pompous, it at times was a tad surreal to be standing in that gorgeous room and thinking all of those folks were there to see me and to toast my book. Definitely a pinch me moment. No, make that a pinch me evening. The hosts were my friend Deborah Needleman and her husband Jacob Weisberg. I have written before about Deborah. She is the editor in chief for T, The New York Times Style magazine. 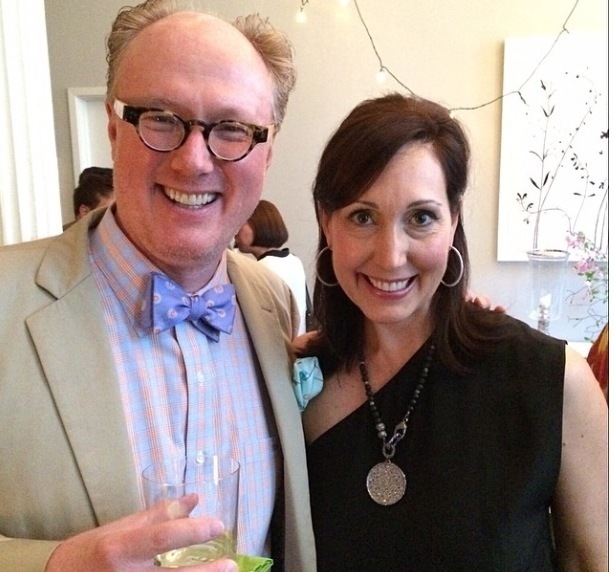 She exudes warmth & style, and was just so amazingly gracious to host the party at their home. A loft space that fit the 100+ folks oh so beautifully. 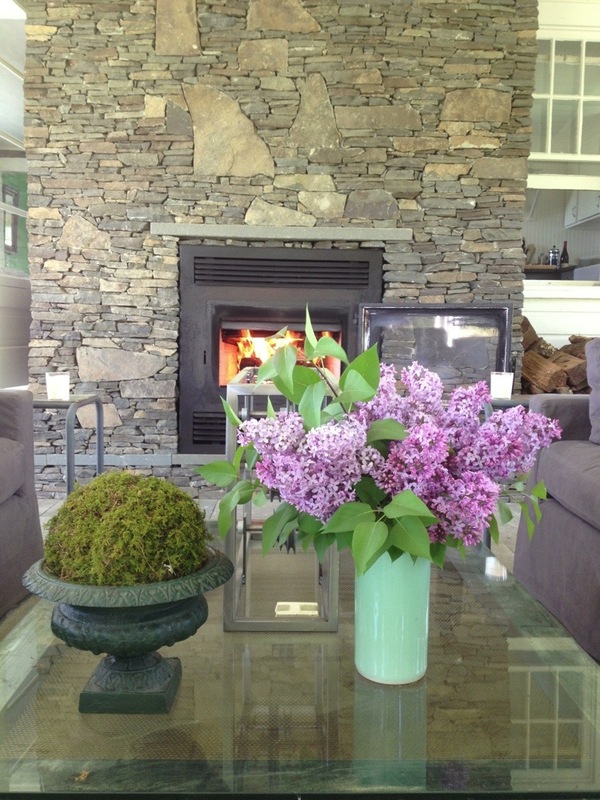 Their home is filled with incredible details of artwork, books, flowers–it exudes love. 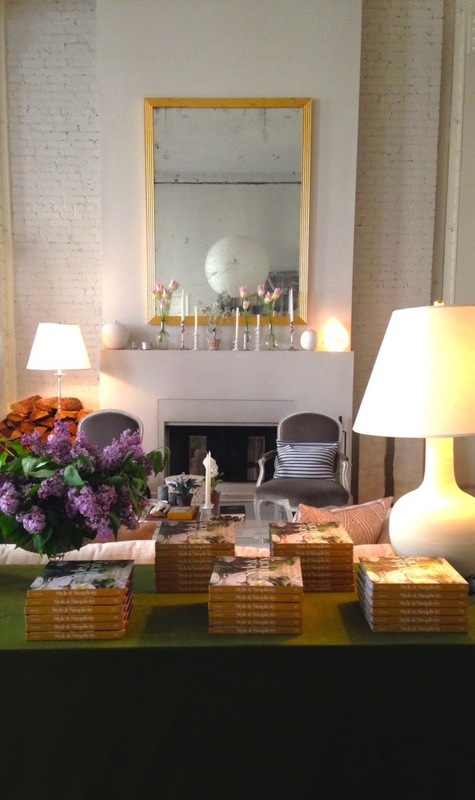 I was just so honored to have my New York book party in their home. 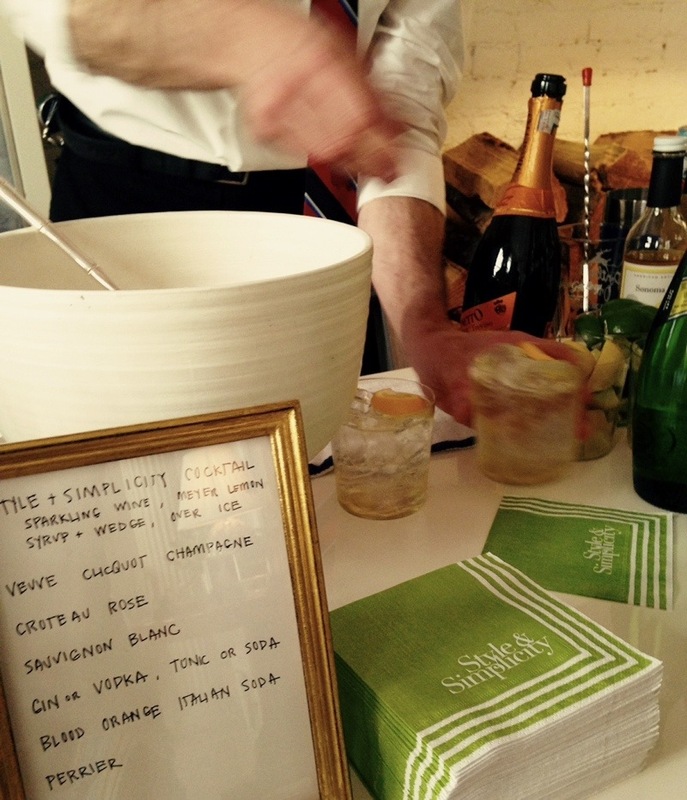 Veuve filled the eve, but the run away hit was the signature Style & Simplicity cocktail. This I concocted for the book launch party at the shop on May 6th in Seattle and thought it would work well for this party too. Sparkling wine, a splash of Meyer lemon syrup, a wedge of Meyer lemon, served over ice. 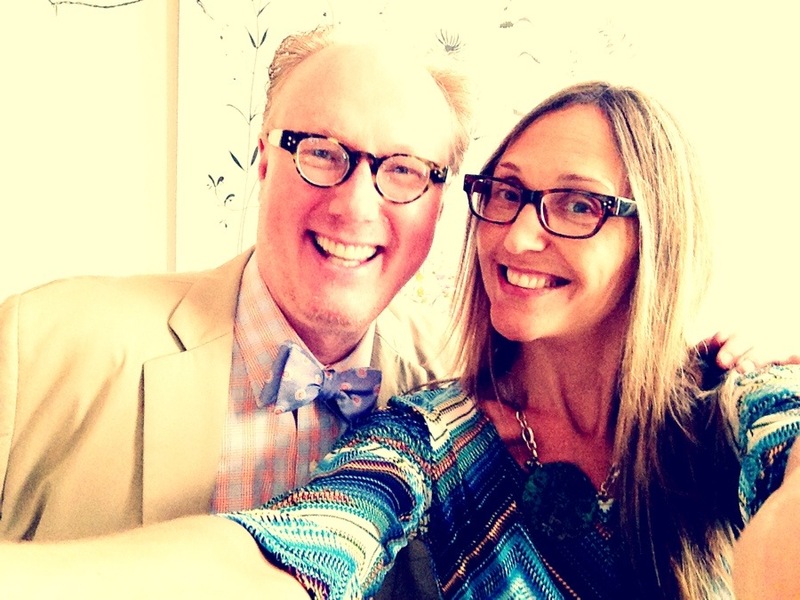 We used the same Marta flat bottomed glasses we used for the Seattle party too. Many, many trays of these were enjoyed! I was surrounded by such love. To be in that room filled with folks I have long admired was so humbling. To hear their praise of my book was pretty darn exciting. Friends came from near and far. Holly Hollingsworth Phillips flew from Charlotte and Jane Dagmi from Florida. My best friend from college Devin Keudell was there. 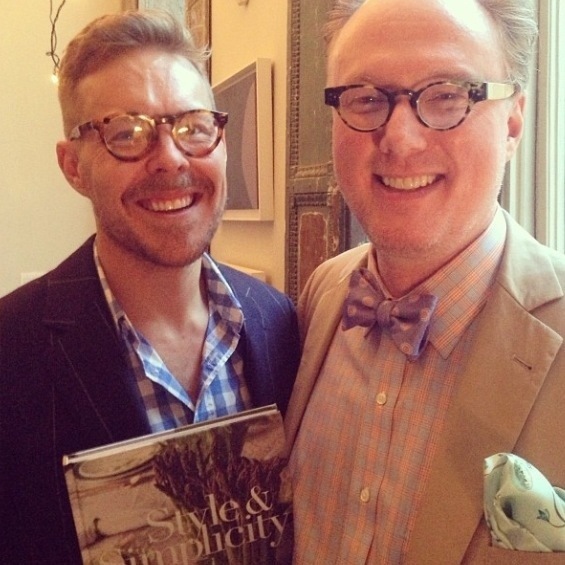 Simon Doonan fixed my Hermes pocket square and made it much more jaunty-er. 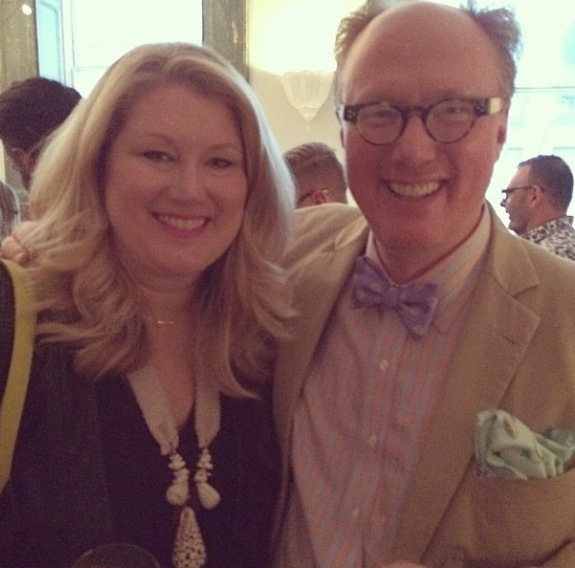 The Hovey sisters who created the book I adore, Heirloom Modern were there. Along with James Dunlinson who was the Creative Director for Martha Stewart, whose work I have long admired and his partner Alistair Turnball. 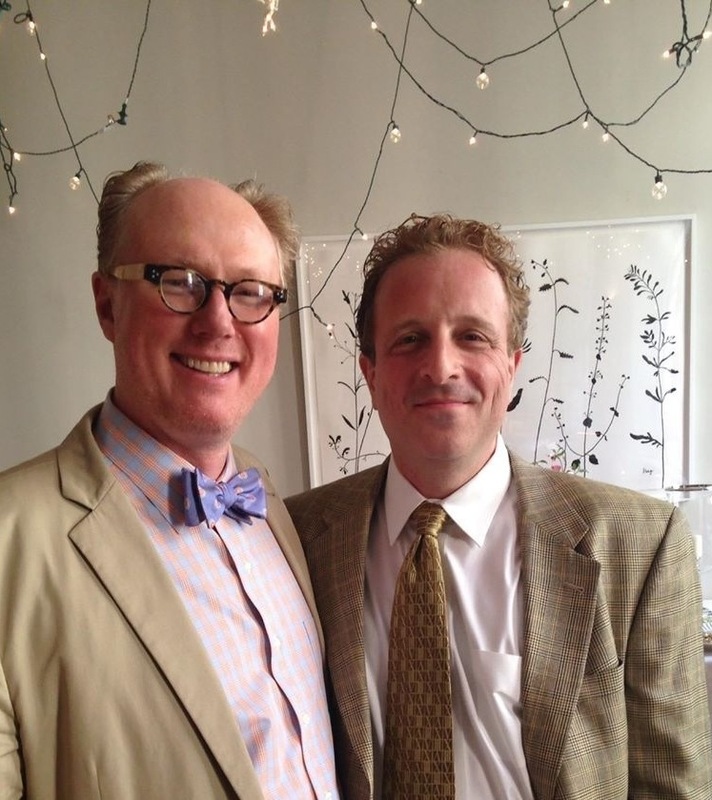 Simon’s husband Jonathan Adler was by his side. Stacey Bewkes who pens the incredibly popular blog Quintessence, along with Ronda Carman from All the Best blog, and Elizabeth Moyer from Pretty Pink Tulips enjoyed the party. 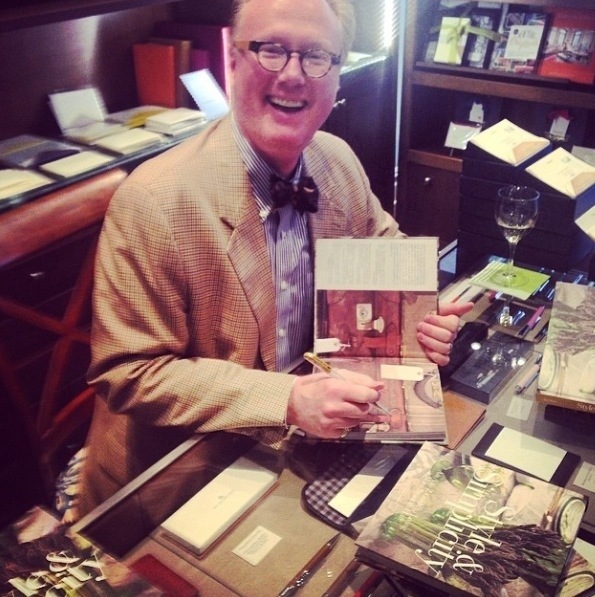 John Derian along with Hugo Guinness and his lovely wife Elliott Puckette were there. Eddie Ross and his partner Jaithan Kochar, who are working on their book attended. Fashion folks Peter Som and Lela Rose were part of the stylish mix. My editor John Foster as well as many folks from Sterling that helped out on the pages and who are helping to promote my book were part of the party. These are but just a few. The creativity in that room was pretty mind blowing. What amazing memories the night created. 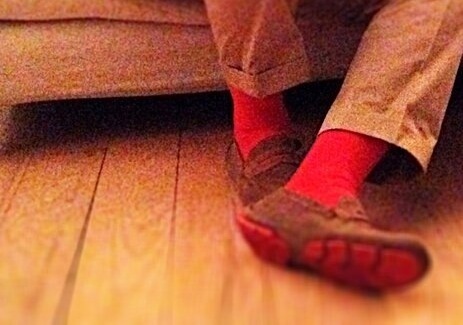 My orange socks were happy to sit for a bit at the end of the party. I just sat and looked at the room, the people, enjoying my glass of Veuve–filled with happiness and gratitude and so very thankful for every moment of it.